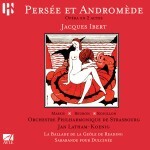 The Orchestre Philharmonique de Strasbourg celebrated its 150th Anniversary in 2005 with an album featuring three of their past prominent music directors: Alain Lombard conducts Bizet’s Symphony in C, Theodor Guschlbauer conducts d’Indy’s Souvenirs, and Jan Latham-Koenig, who made two other acclaimed recordings with the OPS for Avie – Franck’s Symphony in D and Four Orchestral Extracts from Psyché (AV 0003) and Ibert’s Persée et Andromede (AV 0008) – conducts a sweeping version of Strauss’s Don Juan. Please note the booklet notes accompanying this CD are in French only. £7.49 - 40% off - Limited time only! £0.00 This recording is currently available exclusively as a digital download and stream.